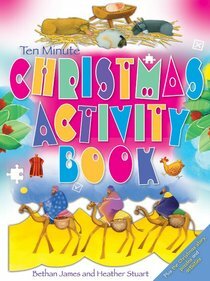 This busy activity book will provide hours of creativity in the countdown to Christmas. It combines the Christmas story and the dynamic events that followed with on-the-page puzzles and activities - perfect as an Christmas holiday book. About "Ten Minute Christmas Activity Book"
Heather Stuart has a degree in illustration from the Kent Institute of Art and Design and a fresh modern style influenced by her Christian faith: her young daughter Melek is her greatest critic. She combines her career as an illustrator with that of a classroom teacher of 4-5 year-olds and 365 Story Bible is the third children's book she has illustrated.